Instead of trying to channel a bunch of pundits that I’m sure are still opining on the tube, I’m going to just give you my gut feeling after watching President Obama’s final State of the Union address. Sad. It made me sad, even though I agreed with many things Obama said and thought they were things that needed to be said. It made me sad because it seems so unlikely to have any impact on the brain-dead politics of left and right in which we are trapped. Obama seemed to know it, too. I was struck by the straight-line mouth and dead eyes that Speaker Paul Ryan maintained through almost all of the speech. I was struck by how few of the president’s applause lines managed to be greeted with bipartisan applause. Even the Democrats in the room, who obviously applauded a lot more than the Republicans did, didn’t seem to have their hearts in it. It’s sad that Washington has become such a grim, phony, gridlocked venue. We have just reached the point where few are even pretending to look for opportunities for bipartisanship, although Obama put in a half-hearted plug for it. We’ve reached the point where anything positive that has happened during the Obama years is painful for Republicans to acknowledge. It’s natural and normal, of course, that Obama would want to brag about how well the economy has done during his tenure and that Republicans would prefer to focus on how much better it would have done under their preferred policies. But they seemed either in denial about the strength of the economic rebound from the Great Recession, or just don’t like to think about it. Yeah, sure, I understand that one of our nation’s great political parties is invested in believing that Obamaism represents feckless weakness that undermines our friends and emboldens our enemies, but if they think there is a more powerful military on Earth, I wish they would say where it is based. OK, yeah, I understand why the party of neo-conservatism couldn’t smile or clap for that one. But it was also sad, if understandable, that Obama semi-admitted he has all but given up on anything big that requires Congressional action happening during the year ahead. Yes, he still seemed to be craving an outburst of bipartisan action, but his tone suggested that he knew it wasn’t going to happen. And so did the tone in the House chamber. So he talked about the need for political reform. But such radical ideas as making it easier for people to vote got the same treatment as above, which seemed like a sad admission by the Repubs that they rely on low turnout to survive. Obama, who has gone grey before our eyes these last seven years, who tried without mentioning names to call out some of the incivility of Donald Trump or some of the militarism of Ted Cruz, came across a little like an old fogey hearkening back to the good old days when our political system could actually function. And hey, at least none of the members of Congress yelled out “you lie” during the speech. “If we [Republicans] held the White House, taxes would be lower for working families, and we’d put the brakes on runaway spending and debt. We would encourage American innovation and success instead of demonizing them, so our economy would truly soar and good jobs would be available across our country. “We would reform education so it worked best for students, parents, and teachers, not Washington bureaucrats and union bosses. We would end a disastrous health care program, and replace it with reforms that lowered costs and actually let you keep your doctor. “We would respect differences in modern families, but we would also insist on respect for religious liberty as a cornerstone of our democracy. We would recognize the importance of the separation of powers and honor the Constitution in its entirety. And yes, that includes the Second and Tenth Amendments. Maybe so. And maybe we’ll find out. A full, slightly annotated transcript of the SOTU address from the Washington post is here. A full text of Haley’s response is here. If you feel the need for a little comic relief, here’s New Yorker satirist Andy Borowitz’s take, written before the speech. Submitted by Paul Udstrand on 01/13/2016 - 08:38 am. Submitted by joe smith on 01/13/2016 - 09:03 am. The Dems didn’t clap for Bush and I bet there was not an article about how sad that was here on Miinpost. The reality is how many times can we get lied to by Bush, Obama or whoever and still take them seriously? The most telling poll I saw last night was a CNN poll, which Wolf Blitzer said was heavily weighted with democratic voters, that said 48% were disappointed in Obama’s 7 yrs. If that is how Democrats feel, that explains the 73% wrong track number you see in direction of our country. Obama promised unity we got division, promised a growing middle class we got reduction, promised fixing Too Big To Fail and gave us Dodd/Frank, promised peace and we have Mid East on fire, promised re-set with Russia (through kindness I think) they are running rough shod again. You could go on and on. I know I lost faith in his words when he laughed about “shovel ready jobs” not being so shovel ready (as he spend most of the stimulus money on political pay backs) and you can “keep your Doctor, I promise. Fool me once shame on you, fool me twice, shame on me. Submitted by Rick Ryan on 01/13/2016 - 09:43 am. Presidents can set lofty goals and ideas for change but it is Congress that must execute those goals and ideas. The influence of money, lobbyists, and fear of defeat in the next primary make achieving real progress on policy impossible. We expect the President to bend Congress to his/her will. It is not possible. Even with majorities in both houses of your own party the forces of MONEY wins out and thwarts anything that challenges Money’s place as the ruler of our nation. Submitted by Elsa Mack on 01/13/2016 - 10:01 am. As a Democrat, I’m disappointed in how the last 7 years went, but I don’t blame Obama. I wish Obama had been able to pursue his goals unfettered by the stubborn, blind opposition of the Republicans in Congress. I think Obama’s speech was right on. Submitted by joe smith on 01/13/2016 - 10:48 am. The 3 branches of Government are set up to make it hard for grand sweeping legislation by 1 party whether it be Dems or GOP. It is set up for vigorous debate over any policy that will eventually become law. Obama did everything in his power to circumvent the constitution many times over starting with some BS procedural vote to get Obamacare passed. No one was allowed to read the monstrosity and lobbyists from issuance companies, healthcare companies and liberal elites wrote it. What a disaster! Is that the type of Government you want? It was unfettered liberalism at its finest after all. Submitted by RB Holbrook on 01/13/2016 - 12:47 pm. First of all, budget reconciliation is not “some BS procedural vote.” Reconciliation has been used to pass revenue bills with limited debate since 1974. Second, President Obama did not schedule the votes in Congress. The President has no authority over voting matters in Congress. Third, the Constitution clearly contemplates that legislation will pass by a simple majority except in certain enumerated instances. Under Article I, section 3, the Vice President votes in the case of a tie. There can be no tie if a larger majority is required. Any idea that legislation must pass by a larger majority is a modern gloss on the voting requirements. Fourth, “No one was allowed to read the monstrosity. . . ” Really? Allowed? It was a long bill, and I understand there are a lot of really big, grown-up words in it, so the complaint was that there wasn’t enough time to read it. No one was ever refused permission. The fact is that the Republicans had vowed to defeat any health care initiative promoted by the White House (after all, health care was going to be the President’s “Waterloo,” and make sure he was a one-term President). Republicans neither wanted, or attempted, input on this bill. “[A]nd lobbyists from issuance companies, healthcare companies and liberal elites wrote it.” What’s your issue? Lobbyists from extractive industries and conservative elites write energy bills–do you object to that? Fifth, the three branches of government were not set up “to make it hard for grand sweeping legislation by 1 party whether it be Dems or GOP, or, for that matter, to ensure “vigorous debate over any policy that will eventually become law.” The Founders wanted a three-part government to prevent a centralization of power in any one branch, and to ensure that the functions of government be exercised by those most capable. Check out Federalist 51 (Baron Montesquieu’s Spirit of the Laws was a major inspiration to them in this regard). Submitted by joe smith on 01/14/2016 - 09:35 am. My 1st attempt tp answer your 5 points didn’t get past moderation, so here is the cliff notes version. Procedural vote is used for housekeeping and clean up votes on bills. Please show me a major vote on a piece of legislation (Obamacare controls 20% of our economy) that was passed by procedure vote. President met with Reid and Pelosi steady about “his keystone legislation” but didn’t meet with GOP. He was setting the agenda with the 2 leaders, remember he said “election have consequences”. He power through a bad bill written by lobbyists, healthcare companies and liberal elites like Jonathan Gruber. Liberals need to at least own up to the process that passed it. The 3 branches were set up so one party could not run rough shod over the country. That was taught in every civics class in the 60’s and 70’s, not sure about today. The bill was added to and changing the whole process. It was a monstrosity that was not allowed to be properly vetted by GOP or public. Own Nancy Pelosi’s words “we have to pass it to find all the goodies in it”. Yes I adamantly oppose lobbyists and elites writing any bill. Lastly on a side note, I see where the liberals are constantly stating we are better than 08-09…. Well I sure as hell hope so! Take one of your worst 3 days of your life and compare it to an average plain old crappy day, which is worse? The economy collapsed in 08, thanks to Community Re-investment Act and greedy wall street bundlers. What did Obama do to fix that, Dodd/Frank made it worse and we are back to pushing loans for folks who don’t qualify…… Not good enough… That is why 73% of folks feel we are on the wrong track after 7 years of Obama. Submitted by RB Holbrook on 01/14/2016 - 11:55 am. Why is it so very, very wrong for a President to “set the agenda?” Did any Republicans express a willingness to work with him, or were they too focused on making him a one-term President? Incidentally, I remember “elections have consequences” as a theme of the GW Bush administration. “The 3 branches were set up so one party could not run rough shod over the country.” No; in fact, the Founders (especially Washington) warned about the dangers of political parties. The three branches were set up as they were so no one branch could be more powerful–parties didn’t enter into the equation. Your teachers were, alas, very wrong. “The bill was added to and changing the whole process. It was a monstrosity that was not allowed to be properly vetted by GOP or public.” Yes, it went through quickly. On the other hand, there was no ban on reading the bill’s contents. On a side note, you may be the last person in America who believes that the CRA was a cause of the crash of ’08. The lenders covered by the Act were not the ones who made and bundled the riskiest loans. Submitted by joe smith on 01/14/2016 - 01:49 pm. The Founders had a system of “checks and balances” so one of the 3 branches (i.e. party, group or individuals) couldn’t control too much power without opposition. Again, taught for years but evidently not to some. Dodd/Frank has taken 10 banks Too Big to Fail and we now have 5 banks that are Way Too Big to Fail, money is more concentrated now in fewer banks, definitely worse! Add in all the small banks and credit unions that went out of business due to Dodd/Frank regulations and it is WAY worse. The middle class that Obama and Frank tell you guys they care about have a harder time getting loans now with Dodd/Frank. Just to throw salt in the wound Barney Frank is on the board for one of the banks that benefitted from his legislation. He is making $350,000 annually to be a board member. Crony capitalism at its finest. Submitted by RB Holbrook on 01/14/2016 - 02:12 pm. Political parties, or groups, or individuals, are not part of the three branches of government. The three branches are the legislative, executive and judicial. That was taught for years in most reputable schools in the US (ask around). I honestly do not understand the second part of your reply. Yes, financial services are concentrated in too few players (Dodd-Frank is not perfect), but few, if any, of the “small banks and credit unions that went out of business” did so because of Dodd-Frandk (Which did not go into effect in full until 2014, and which exempts small banks from many of its provisions). Besides, if the financial crash was caused by people who were unqualified getting mortgages, why is it a bad thing that Dodd-Frank makes getting a mortgage more difficult? Submitted by Bob Petersen on 01/14/2016 - 03:25 pm. The housing bubble that led to the Great Recession was due to the excessive amount of people obtaining mortgages beyond the actual value of their homes. This surge in money caused for unprecedented amounts of spending that could not be sustained. There was an excessive level of refinancing done by people that were unqualified in previous years. Democrats used to complain and demand that mortgage requirements be greatly lowered because the most of those that were denied lived in poor neighborhoods. The demands were the same things we hear from liberals today, it is systemic racism. Then when many were finally able to refinance, scores of them very soon started to default. In the meantime, the banks and mortgage lenders were packaging these high yield mortgages to be sold. Then those started to not pay off or for pennies on the dollar. By the time anyone knew what was going on, the reach of these investments was wide ranging and too difficult to stop. Then Dodd-Frank comes in and in true government fashion, over regulates the system making the problem much worse – very similar to many original SOX regulations when that first came out. The ability to get money was too tough to get. So sometimes, having it be difficult to obtain a mortgage is actually a good thing. Before it was way too easy and look what happened. Submitted by RB Holbrook on 01/14/2016 - 05:01 pm. Subprime mortgages and securitization of mortgages were creatures of the free market. Dodd-Frank (enacted after the housing bubble–that isn’t clear from your comment) tries to reign in the worst of these practices, but I understand it was legislation sponsored by Democrats and signed by President Obama, so it is an article of faith that it must be bad (“It was too easy to get a loan, and that made the economy crash! Now it’s too hard!”). Submitted by Sean Olsen on 01/14/2016 - 04:35 pm. Obama spent the entire summer of 2009 waiting on Chuck Grassley and the “Group of Six” to hammer out a compromise in the Senate. He waited until Grassley publicly admitted that he had no interest in any sort of deal before moving forward with the bill in its final form. Submitted by Neal Rovick on 01/13/2016 - 02:38 pm. Work on putting together a bill began in March 2009. The House passed its version in November 2009 and the Senate passed their version in December 2009. The final version was passed and signed in March 2010. If it wasn’t read, analyzed, and discussed in the year it took to assemble, reconcile and pass, it was simple dereliction of duty on the part of your favorite representatives. Submitted by Carolyn Jackson on 01/13/2016 - 09:23 am. I helped a candidate door-knock in my legislative district in 2014. Some of the people we met at the door were openly hostile to any politician reaching out to them. “We” the voters include people who hate the political process and cannot be reached. It is very sad that good neighbors and voters are so disgusted with politics that they will not even engage in a discussion about solutions. Submitted by Neal Rovick on 01/13/2016 - 09:30 am. I was struck as to how much Haley’s speech gave many of the same prescriptions as Obama’s did, but yet managed to attack Obama and his proposals. And really now, given that the Republican “do nothing” Congress did nothing to help the economy or workers, and hasn’t even issued an authorization to use military force against ISIS, and hasn’t come up with a plausible replacement for Obamacare,.the speech was pretty hollow. ….“As he enters his final year in office, many Americans are still feeling the squeeze of an economy too weak to raise income levels. We’re feeling a crushing national debt, a health care plan that has made insurance less affordable and doctors less available, and chaotic unrest in many of our cities…. Best economy in the world in a very difficult time, deficit decreased, 18 million insured, and tell me now, which of many cities are now experiencing “chaotic unrest”? Followed by her story of the Charleston shooting…“That night, someone new joined them. He didn’t look like them, didn’t act like them, didn’t sound like them. They didn’t throw him out. They didn’t call the police. Instead, they pulled up a chair and prayed with him. For an hour.“We lost nine incredible souls that night”…..
Did that phrasing of the story really address the fears of the “other”, or was it the double edged straddling a difficult issue ? Submitted by RB Holbrook on 01/13/2016 - 09:40 am. That is a telling comment. What traditions would those be? Frankly, it sounds like a dog whistle. I think we all know who who would be excluded under that criterion. It’s just that Governor Haley is much better spoken than a certain wealthy real estate developer. I would also ask why approval by Israel should be a goal of American foreign policy decisions. Why is a party that pretends to be so protective of our national sovereignty pushing that view? Submitted by Dennis Tester on 01/13/2016 - 12:14 pm. What traditions would those be? “You didn’t build that. Someone else made that happen.” – Barack Obama. Name another president in our history who would have ever said such a thing. Submitted by Pat Berg on 01/13/2016 - 01:08 pm. There’s nothing wrong with telling it like it is. In fact, that’s refreshing from a politician. Submitted by Edward Blaise on 01/13/2016 - 01:17 pm. Submitted by richard owens on 01/14/2016 - 07:53 am. Submitted by RB Holbrook on 01/14/2016 - 10:29 am. Submitted by John Appelen on 01/13/2016 - 10:29 am. “Obama urges us to fix politics, but we’re not listening” The comments here remind me of the following quote and clearly show that many are not listening to Obama. By the way, of course politicians will not be caught on video cheering on the opponent during his speech in our negative ad society. That video clip would be a gold mine in future elections. Maybe if we “fix politics” things will be different. Submitted by Bob Petersen on 01/13/2016 - 10:38 am. The reaction to Obama was because he wasn’t speaking about the greatness of our country and where it is headed. It was more of the usual same, boring, preaching that Obama has done every time. Everyone is tired of it. He talks down to everyone. He preaches bi-partisanship yet has tantrums when the Republicans don’t do his bidding. Obama has never been one to compromise. So when he doesn’t get his way, he does all these Exec Actions and blames Congress. The Dems, while they will applaud, are more reserved because Obama has led them to losing both chambers and weakened their position to the electorate. More local elected positions in the US are held by the GOP than never before. This is not all by accident. Obama has been one of only lip service since he first ran for president. The only time he got things ‘done’ was when he had both houses of Congress and did not listen to the people. Yet, almost everything he has promised has never been fulfilled. So instead of looking at himself, he chastises others. Of course, this has been his MO every time. So why would anyone be excited for what he says? Submitted by Neal Rovick on 01/13/2016 - 11:04 am. …He talks down to everyone…. I am genuinely curious as to what you see as his talking down to people. But I definitely disagree with your statement….he wasn’t speaking about the greatness of our country and where it is headed…. Submitted by Brian Simon on 01/13/2016 - 01:13 pm. You must have watched a different speech than I. He stated pretty clearly exactly what you say he didn’t. Which, I think, is eric’s point. If we can’t even agree on what was said, how can we possibly agree on what to do? Submitted by Tim Smith on 01/13/2016 - 10:47 am. this President has been as partisan and divisive as anyone in Washington in a long time. Everything he deems wrong is the fault of congress and Fox News. He plays to his base, no one else, and plays the victim card like never seen before. His idea of bipartisanship is for congress to do it his way, or at least come 90% to his side. No one has demonized American success like this President (they didn’t build that). If you have a nickel more than the average the American liberal deems you a bad person. From the start he has divided us into group and pitted us against each other. men vs. woman, black vs. white, suburbs against city, north vs. south, etc. Read your own condescending words Mr. Black, “compared to some unhappy examples of recent years Nicki Hayley came across as “FAIRLY HUMAN”…hello pot, this is the kettle calling. a partisan column lecturing us on bipartisanship. Welcome to liberal America. Submitted by RB Holbrook on 01/13/2016 - 12:02 pm. Give me a break. The Republicans had resolved from day one that they were not going to cooperate with President Obama. They are proud of their non-cooperation. Anyone who dares do anything that could be construed as getting along with President Obama is branded as an apostate. “From the start he has divided us into group and pitted us against each other . . .” Another load of nonsense. Republicans have been pushing the idea that they represent the “real” Americans–largely white, small town or suburban-dwelling Christians–since the Reagan presidency. Can we mention that not all Americans fit that mold? No! That’s rampant political correctness, not to mention victimhood (everyone know conservatives are the real victims–just ask Kim Davis). Submitted by Bob Petersen on 01/14/2016 - 03:33 pm. Obama had both houses of Congress. Because he had an unfettered track to destroy our country more than it would have been going, the Republicans could only sit on the sidelines. It is of no accident that the Dems lost both houses of Congress. It is because what the Dems did those first two years of Obama’s presidency needed to be fought. The things passed in that time is going to cost our children dearly to get out of. And is it so wrong to point out that a president is heading us on a path where most don’t want to go? The GOP had to fight all of it. Submitted by Matt Haas on 01/14/2016 - 08:52 pm. Where WHO doesn’t want us to go? Surely not I or the other majority of folks who elected the President, twice. So you must mean the small fraction of society who bothers to vote during the midterms, you know where 20% nationally is a big number. Considering your side gets, we’ll be generous here, 55% percent of THAT total, I think even you could agree that your cohort is pretty small. Not that it’s ever stopped a conservative from purporting to speak for the desires of every human on earth, or actually being brainwashed enough to think they really do. Submitted by Paul Brandon on 01/13/2016 - 11:15 am. are the ones who benefit the most from the way it is now. Submitted by John Appelen on 01/13/2016 - 12:50 pm. I would expand that to say that the current governmental chaos and ineffectiveness is good for politicians, bureaucrats and even public employees. On the other hand it is not so good for the citizens receiving services, the tax payers or for the global competitiveness of our country. It reminds me of the Big 3 automakers before the foreign competition and the American Consumers flocking to them forced change. The owners, managers and employees were all making excellent money providing a poor low quality product for high prices. Only the people paying the bill and using the cars were hurting… Everyone in the system was smiling all the way to the bank. Submitted by RB Holbrook on 01/13/2016 - 01:20 pm. How does the “current governmental chaos and ineffectiveness” benefit public employees? They are the ones who get unpaid leave when a serious hissy fit shuts down the government. Submitted by John Appelen on 01/13/2016 - 03:52 pm. It is likely we will disagree, however I believe if government was truly functioning effectively and efficiently, (ie setting clear priorities, defining good operational metrics, specifying performance quality goals, effectively measuring performance, holding employees accountable, paying market based compensation/benefits, eliminating waste, etc) their would be fewer departments, employees, redundancies, etc. Submitted by RB Holbrook on 01/14/2016 - 09:49 am. You’re overlooking a couple of important facts. First, the effectiveness of government is necessarily measured by different metrics than private business. To take but one example, the USPS delivers mail to any address in the country, for a single price. Is that efficient? Arguably, but is it efficient to have the customer who mails a greeting card to her next-door neighbor subsidize the one who mails a card to a cousin in Alaska? Would the private sector do that (and the USPS is a monopoly only if you disregard UPS, FedEx, e-mail, etc.)? Second, what the government does, and how it does it, is set by the consumers of the services. The inefficiencies are often built into the system, and not just to benefit public employees (BTW, your stereotype of government employees as uninterested in anything but protecting their sinecures is, at best, silly. It’s kind of like stereotyping all wealthy people as evil, rapacious, and greedy). The inefficiency is a feature, not a bug. Consider the inevitable uproar from parents when a school is going to be closed due to low enrollment. Are their voices entitled to be heard, and to try to persuade the school board otherwise, or should some technocrats make the decision on the best allocation of resources? Democracy is not just messy, it is incurably inefficient. Third, how do you pay “market based compensation/benefits” to public employees? You really are comparing apples to oranges for a lot, if not most, jobs. What does “the market” pay firefighters, or law enforcement officers, or, for that matter, soldiers (yes, they too are public employees)? Finally, “their unions survive where they would not in the private sector (ie consumers won’t pay for them as we have seen).” Are you serious? Here in the United States, there has been a concerted anti-union campaign in private business that gained traction over 30 years ago. It had nothing–nothing!–to do with consumers. Submitted by John Appelen on 01/14/2016 - 06:25 pm. 1. Metrics can be whatever the management team wants them to be. Minimizing costs may not be one if other goals trump it. 2. I don’t think I ever said or implied that Public employees are exclusively interested in their own self interest. I remember listening to a Teacher try to explain to the Rdale school board that they should build a wind turbine at a school for an instructional aid. And he was serious… Which brings us back to the point, their is no competition and therefore “hobbies” and waste proliferate. 3. Easy… Just like we do in Private industry. Most of us don’t use collective bargaining, have work contracts, etc. The military is probably the only group that needs 4 year contracts because of the huge and training burden. 4. It is the American consumer who decides where they spend their money. No one else. They walked away from the UAW companies in droves, and happily buy products from overseas and right to work states. They want value… The union does support their getting it. Submitted by RB Holbrook on 01/15/2016 - 10:47 am. 2. Yeah, you kind of did. Your example contradicts your denial (Incidentally, as the parent of a child who was lucky enough to take four years of engineering courses in high school, I see instructional value to a wind turbine). 3. Without collective bargaining, wages in the private sector are set by management fiat. In the real world, individualized bargaining over the terms and conditions of employment is available only to a small slice of the work force. Labor is nowhere near as mobile as conservatives like to pretend it is. 4. I remember well when the American consumer started buying imported cars en masse (cars made, it should be noted, in heavily unionized factories abroad). They did so because of the higher quality and superior economy of imported vehicles. Is there a serious price differential between a Chevy made in Michigan and one made in Tennessee? Submitted by John Appelen on 01/15/2016 - 11:14 pm. 2. I disagree. And if one has unlimited resources, one can have everything including that wind turbine. For most of the rest of it is about goals, choices, trade offs, priorities and focus. Since the public employees are for the most part spending other people’s money, some of them tend to be like children in a candy store. What they want is not necessarily bad, it’s value just does not justify the cost. 3. No.It is set by the minimum wage, employment law and supply and demand. I would be interested to see what kind of employee a local engineering firm would get if they insisted on paying minimum wage. Submitted by Dennis Wagner on 01/13/2016 - 09:28 pm. Submitted by John Appelen on 01/14/2016 - 07:10 am. Probably not. 🙂 I think there are enough domestic options for competition. Submitted by Russ Hilbert on 01/13/2016 - 11:20 am. But it was ok for him. What a hypocrite. Submitted by Patrick Stiehm on 01/13/2016 - 01:37 pm. Submitted by Ron Gotzman on 01/13/2016 - 01:42 pm. Eric – you deserve a metal for watching the creative ways Obama says the “same old stuff” year after year. It is truly amazing how creatively he weaves in his laundry list and mentions the same old Democratic special interest group every year. It is equally amazing how he endeavors to create even more special interest groups and buy their votes with even more government programs. Switching from the Timberwolves to the gophers to Obama. I truly heard more “rim shots” from Obama. That is saying a lot! It is humorous as Obama declares that we need to get along and change the tone and then caries on a tirade against the GOP. Obama is a great orator, community organizer and creative speaker. However, he is not a leader, has no new ideas, and an extremist. That is why he accomplishes little legislatively – not that the GOP are unwilling to compromise. Submitted by Paul Brandon on 01/13/2016 - 05:27 pm. has nothing to do with basketball. Submitted by Hiram Foster on 01/13/2016 - 02:28 pm. So does anyone have any proposals for making things better? Submitted by Edward Blaise on 01/14/2016 - 08:40 am. 1. Total transparency for all political contributions: a quick way to get from any paid political piece to the individuals who funded it. The arguments on contribution limits are endless, rather than fight that, make things transparent. 2. Consequences for lies and distortion: Yoplait sues Chobani for yogurt ad distortions. What’s more important, an ad for yogurt or our next President? Use the transparency above to make those individuals financially liable for lies proven through an agreed to process which ends in the courts. Trump would already be broke. If we sold cars like politicians imagine how many Chevy ads would have featured exploding Pintos? 3. Term limits of 3 – 4 year terms in the House and 2 – 6 year terms in the Senate. These jobs have simply become too dear to the incumbents and the lengths they will go to stay in office have passed all reasonable considerations. Time for drastic action. 4. End lobbying as we know it. Remember how you saw a professor in college? You sign up for office hours and wait your turn. No privileged access, the guy peeved about water quality in the stream behind his house has the same access as the President of Pfizer Pharmaceutical. Only in politics do we try to act like free advice is actually worth something. Submitted by RB Holbrook on 01/14/2016 - 11:15 am. 1. I agree, 100%. Spend what you like, just do it openly. 2. I see constitutional problems here (I know the courts in one state have held laws criminalizing false political advertising to be unconstitutional). The truth can be elusive in a political campaign, and I think it’s best not to get the courts involved in parsing the accuracy of statements too much. How would we deal with “Yes, but . . .” statements, that are technically correct, but merit explanation? 3. Big no on this one. Term limits are inherently anti-democratic, and deprive the people of the full range of choices for office (I do support making ballot access easier). It’s a somewhat arbitrary notion that turnover–as opposed to the possibility of turnover–is good for its own sake. Taking away the more experienced legislators would also empower lobbyists, since no legislator would be able to develop expertise in a field. 4. Hmmm. More constitutional problems (the right to “petition the Government for a redress of grievances”). I think transparency here is also the answer. Who met with your representative or her staff? Whom do they represent? Submitted by Edward Blaise on 01/14/2016 - 02:05 pm. Can you help me out on #2: Is the standard for political libel any less or different than that applied to commerce? If not, it seems more a matter of will than anything else. Yoplait feels pretty strongly about their brand and has little tolerance for any distortion that it feels is baseless so they go after Chobani. Is it a lack of will; or, just an acknowledgement that in politics that they all lie and distort at similar rates and choose to not go down a path of accountability? And on #4, the guy with a water problem has the same need to redress grievances as the big drug guy. I do agree on the the transparency of meetings. I checked a few years back and could only find one Senator (Tester of MT) who kept a published schedule; but, it was not very expansive on his activities. Submitted by RB Holbrook on 01/14/2016 - 02:45 pm. Commercial speech has always been regulated more closely, and until the mid-70s, courts held that it got no or minimal First Amendment protection. You’re right about the need to redress grievances. It could be argued that the guy with the water problem may have a more urgent grievance than the big drug guy (ask any farmer). It has always amazed me that politicians are not more aware of the optics of spending loads of time with corporate lobbyists while limiting contact with constituents to the occasional town hall meeting back home, or a pat on the head if they run across them in Washington. Submitted by Edward Blaise on 01/14/2016 - 04:13 pm. If not criminal, does one candidate have the same option as Yoplait to argue for damages to their brand? And even more broadly, can a voter claim that false information damaged their ability to make a just decision? I guess that gets at the value of one’s vote. If we have class action settlements handing out $2.00 coupons to the damaged parties, could the same be applied to a damage of similar consequences in a political situation? Kind of like giving Politifact a squadron of lawyers to seek redress for “pant’s on fire lies”. Possibly a better occupation of time for some members of the legal profession. There just seems to be no consequences for political lying, and in fact, it more frequently offers political advantage; so, it proliferates as never before. Submitted by RB Holbrook on 01/15/2016 - 09:36 am. Pretty much. Ideally, the consequence would be that the candidate who lies, or who countenances lies on his behalf, loses the election. Unfortunately, as we know, it doesn’t work that way. My own take is that while political lying is not just bad, but destructive, the remedy is worse. If it’s a choice between having a prosecutor or a court scrutinize campaign statements and a lying candidate, I will take the lying candidate. I wish those weren’t our choices, but there we are. Submitted by Paul Brandon on 01/14/2016 - 10:18 am. That would at least turn down the money faucets. Submitted by Ray Schoch on 01/13/2016 - 02:33 pm. I confess to considerable disappointment in his two terms in office, but not because he has tried to foist some radical agenda of his own making on an unwilling nation. I’m disappointed that a number of truly venal and craven Republicans in Congress have – rather successfully – thrown obstacles in the path of the program he laid out when he campaigned, and that – a reminder here to the sore losers – the American public agreed with, which helps explain why *he won both of those presidential elections. * Neither of those electoral victories required the intervention of multiple judges and of opposing party local officials to disqualify sizable numbers of votes in his favor. I’m also disappointed that he has kept trying to wring some small measure of cooperation from political leaders of the opposition party when it’s obvious to even an amateur observer like me that they take considerable pride and pleasure in being able to stop, or at least hinder, his policy proposals, and/or to make their implementation far more difficult, or even impossible. I’m further disappointed that my former political party has so obviously and blatantly based so much of its opposition to his presidency not on policy – after all, the Affordable Care Act is a Republican idea, first implemented by a Republican Governor in Massachusetts, and fully endorsed by profit-making health insurance companies – but on the fact that an obviously multi-racial man had the temerity to run for the nation’s highest office, and then, even more offensive, to actually *win* that office. Some of the commenters here are still beside themselves at the perceived injustice of it all. What I’ve seen at the federal level in the past 8 years is that Obama wanted, perhaps naively, to govern. His Republican opponents simply wanted to make sure that – as much as they could get away with constitutionally – he could not do so as effectively as he and many others would have liked. What I’ve seen and heard from members of my former political party suggests to me that they are not interested in governing. They want to rule. The two are not at all synonymous, and one of them is the antithesis of democracy. Submitted by Tom Anderson on 01/13/2016 - 09:08 pm. Look at the reaction from our Senators and Representatives in Congress to the speech. Submitted by Dennis Wagner on 01/13/2016 - 09:44 pm. All these problems? always has been always will be, as the optometrist would say is it better or worse? If you think its worse today than in 2008-9 you need glasses and then some. Submitted by Edward Blaise on 01/14/2016 - 09:48 am. Expanded food stamps and welfare assistance. Supported the Equal Rights Amendment. Yes, that Richard Nixon was a liberal rascal far beyond the meager liberal accomplishments of BHO. The simple fact that we cannot get results on issues where there is clear, 60% plus agreement from the public is the worst part of the past 8 years. Agreement and compromise allows each party to declare victory and tell the public how great they are without having to savage their political opposites. Without that, all we get is relentless negativity. Bush / Cheney and Obama / Biden have certainly taken far different tracks to governing yet the one thing we know to be consistent is that the public agrees that both are / were on the wrong track. How can that be? We essentially reversed direction and were still going the wrong way. Why? Unending, relentless negativity from one party or the other because they can find no reason to ignore, much less compliment their political opposites. It is a self fulfilling prophesy and will only end when they begin to find common ground that allows each party to occasionally say: ” we’re doing pretty good here, things are really looking up”. Submitted by John Appelen on 01/14/2016 - 08:00 pm. What are these topics on which 60% of the people / states agree on? I mention states because we do not live in a national democracy. The majority on the coasts and in the big cities do not get to set policy without the support of the heartland / rural areas. Submitted by Matt Haas on 01/14/2016 - 09:01 pm. For those “rural and heartland” folks to remember that as they attempt to ram through every “traditional” social policy position and New Deal dismantling proposal they can conceive of, no? Submitted by Edward Blaise on 01/15/2016 - 08:32 am. Now, I know your next point will be: Some of those results are a couple of years old. Which is exactly my point: We had reached a point where the Senate passed a bill, the President indicated a willingness to sign it and the sentiment of red states and blue states favored it by significant margins. The House refused to take it up. If they had, it would now be pointed at as a shining example of how bi-partisan government works by adult legislators. Some would then say maybe we could do the same thing on infrastructure renewal or making fixes to Obamacare. Instead we operate in a system incapable of simple math: 55% Republican X 20% Tea Party Republican gets us to 11% of the population deciding what is right for the other 89%. We Ain’t Making America Great Again. Submitted by John Appelen on 01/15/2016 - 04:48 pm. Apparently it is just good strategy. And per the sources you provided it looks like Republicans supporters are pretty well split down the middle. I would not note the source’s age usually, I would be more interested in the wording of the survey questions. And how the article spins the result. – Imagine if we started offering amnesty without locking down the border first. All the Central American poor that would risk their lives, and many losing their lives trying to get here. – Also, I simply don’t like rewarding line budgers. I feel for all those legal immigrants who follow procedures. If you want more immigrants, lock down the borders and allow more legal immigrants in. Seems simple and logical to me. Submitted by Dennis Wagner on 01/15/2016 - 09:45 pm. Is that the border can be 100 % locked down! Kind of like we can prevent 100% Tax and welfare fraud! Submitted by Edward Blaise on 01/17/2016 - 09:39 pm. I did not offer the stats on the immigration bill to spur debate on it. You asked if there were issues that not only have strong majority support; but, also have a majority of states supporting the same issue. A compromise on immigration should now be in our rear view mirror because it met your criteria: majority support in general and across the states. It did not progress because, as I explained, 20% of a 55% majority, otherwise known as 11%, stopped it. And you are happy. Good for you. Let’s say President Cruz decides to implement a few of his campaign promises and then the 11% will cut the other way and you and yours will howl like scalded dogs. We need to return to the days of reasoned compromise and yet ask any of our GOP candidates their position on the need to compromise with the Ds and they will all say no how, no way. Look at how they hung Paul Ryan out to dry on the recent budget compromise. Chris Christie called the President a “petulant child”. He needs to look into that over sized mirror he has on the wall if he really wants to see one. Submitted by John Appelen on 01/18/2016 - 11:31 pm. I won’t be howling if the far right is blocked, any more or any less than I do when the far left is blocked. I am somewhat of a social liberal and fiscal conservative, therefore neither party excites me terribly. My point of digging into the stats and surveys a bit further is that the devils are likely in the details. It is easy to say that one supports immigration reform when it is vaguely defined. Even I can support immigration reform after the borders are locked down better. (ie stop the water leak before starting to mop up the kitchen) From my view it was the Democrats who wanted to put the cart before the horse. In summary, I don’t think a majority of citizens want to keep a fairly open border while enticing foreigners to violate it with citizenship. Let’s say we give border jumpers a Path to Citizenship if they can just get into the country. Do you think this will encourage people to follow the standard immigration process? Or will more folks be encouraged to run the people smuggler gauntlet to get onto American soil? Submitted by John Appelen on 01/18/2016 - 11:50 pm. After looking at the following link, I think reasoned compromise may be over rated. 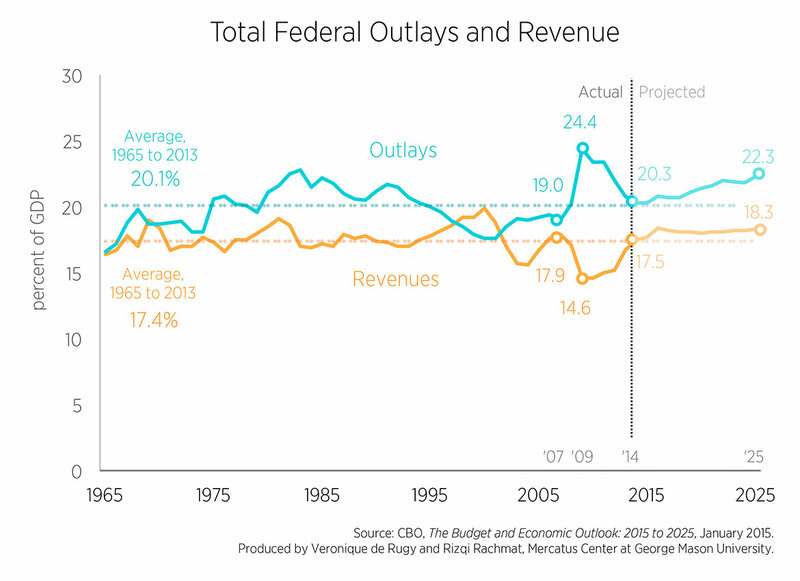 It seems that decades of reasoned compromise have led to an unsustainable trend in spending. No matter how much the supposed Conservatives give in the way of spending increases, the Liberals say they are not spending enough and that we should spend more. Please remember that the Dec bill increased the deficit again. So the following debt curve will only be worse. I am not too happy with the trends of these curves and what they mean to my children’s generation. Submitted by Edward Blaise on 01/19/2016 - 03:20 pm. 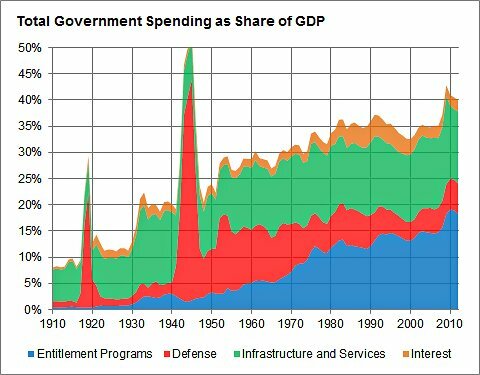 If you look closely enough you can see that the early to mid 60s, late 70s, most of the 90s and the most recent data shows spending as a % of GDP declining. It looks like our Democratic Presidents are the financially prudent ones. Submitted by John Appelen on 01/20/2016 - 09:22 am. It seems we do best when the GOP controls Congress and the President is a Democrat. (ie Bill Clinton & Gingrich, Obama & Boehner) We seem to do worst whenever one party controls all. As I said, I love gridlock since it forces real compromise. Please note though that over the decades government keeps controlling a bigger piece of the pie, which means individual citizens have less control. And government keeps raising the debt load it carries in our name. Submitted by Dennis Wagner on 01/20/2016 - 07:08 pm. We raise the debt load by allowing/aligning with BS debates and topics and fighting against ourselves. Untied we stand divided we fall! The well to do have done a wonderful job at class warfare within the middle class pretty much evenly divided. We are losing, the “We the people………………..” Goal. Submitted by Anthony Walsh on 01/20/2016 - 09:24 am. It seems that decades of irresponsible compromise have led to an unsustainable trend in tax cuts for no legitimate reason and no documented benefit to the economy. No matter how much the supposed Liberals give in the way of tax expenditures and cuts, the Conservatives say they are not cutting enough and that we should “cut-cut-cut” more. Please remember that the Dec bill increased the deficit again with 700 Billion(830 Billion including borrowing costs), that we know of, in unpaid tax cuts. So the following debt curve will only be worse. Submitted by John Appelen on 01/20/2016 - 01:37 pm. However revenues have been pretty constant for a long time. It is spending that went up. Submitted by John Appelen on 01/16/2016 - 08:08 am. Four Hundred Thousand per Year of people with no background checks etc….. That is like everyone in Mpls and St Paul migrating here. This is not just a few here and there. No wonder we have an active illegal drug import business if the border is that easy to violate. Submitted by RB Holbrook on 01/19/2016 - 09:26 am. We have “an active illegal drug import business” because there is a demand for illegal drugs. It has nothing to do with how tight the border is. Surely, you can see that it’s basic capitalism, right? If there is a demand, some enterprising type will step in to fill it. They seem to be pretty unsavory in this instance, but that is a consequence of illegality. Submitted by John Appelen on 01/19/2016 - 10:50 am. “Barriers to Entry” is a capitalistic concept also. Our physical and financial barriers to entry are just too low. They can smuggle the product and/or people in cost effectively and still make a profit. The questions is how do we raise the import costs to a level where most of the American users are unwilling / unable to pay? And the potential border violators stop trying? Submitted by RB Holbrook on 01/19/2016 - 12:04 pm. Focus on demand, not on supply. Hit employers who employ undocumented workers hard. Don’t just levy small administrative penalties, or let them walk away with a “Gee, I didn’t know–the rules are so complicated.” Make the penalty a stiff criminal fine, levied against the employer (e.g. the corporate entity), and not some poor fall-person assistant in the HR department. Let that business be debarred from government contracts for a few years. The potential penalties are always figured into the costs of doing business for any regulated industry. If violations are cheaper than compliance, compliance is going to be a lesser priority. Compliance will go up if the prospect of a few years on the Group W bench is something that will happen to the company, and not just an unlucky employee. Submitted by Dennis Wagner on 01/20/2016 - 07:03 pm. Isn’t that Government over stepping into private enterprise as well as squelching the free market and right to work laws, entrepreneurship, etc. etc. etc ? (Tongue in cheek) Is there a dilemma forming here? Submitted by John Appelen on 01/20/2016 - 08:32 pm. I think we should also penalize any charities, government agencies, schools, etc who support these folks who should not be here. Then maybe more folks will self deport, fewer will cross into the country illegally and more will follow the legal process. Sound good? Submitted by John Appelen on 01/14/2016 - 08:04 pm. I think us in the middle and to the right would say the same for Sanders, Ellison, and the rest of the CPC.